It’s early in the afternoon and Cullen Omori is sitting behind a small table at Intelligentsia, a coffee shop in Chicago’s Loop business district, sipping a cup of black coffee and occasionally brushing back his long, dark hair like Mitch Kramer from Dazed and Confused. His bandmates in Smith Westerns— his brother, bassist Cameron, and guitarist Max Kakacek—are driving around in their white tour van; they couldn’t find parking downtown, so they just dropped their frontman off to do the interview solo. The kids, it seems, are all right. 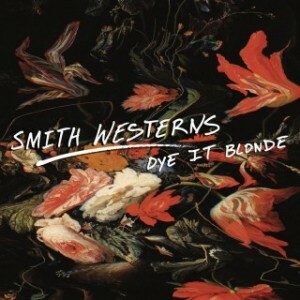 But once you listen to Smith Western’s sophisticated sophomore album, Dye it Blonde, a blazing set of fuzzed-out, tightly wound guitar pop inspired by everything from Zeppelin and Big Star to Suede, you’ll have trouble referring to them as kids. They’re understandably sick of hearing it. Sure, the guys released their self-titled debut in 2009 when they were still in high school, and, yes, they still crash at their parents’ when they’re not touring, and, no, they can’t legally order drinks. But take in Omori’s soaring, wistful lyrics (“I want to grow old before I grow up,” on “All Die Young”) or hear him talk about life on the road, surrounded by examples of arrested development, and a more experienced voice emerges. Omori admits that his band is privileged to be where they are right now, concentrating fully on music. How many other 20-year-olds count photographer Ryan McGinley as a friend and have opened for MGMT? In the same amount of time it took many of their contemporaries to rack up a couple of semesters of college credit, Smith Westerns went from being high school pals at Northside College Preparatory school to an accomplished act with slots at the Pitchfork Festival. Instead of setting up a recorder in Kakacek’s basement—as they did for their debut—Smith Westerns had a real studio in New Jersey at their disposal for Dye it Blonde. From Kakacek’s gritty riffs playing off the background chimes of “Weekend” to the anthemic bridge on “Smile” and solemn organ and guitar on “All Die Young,” this is music that glistens.